The 21st century has allowed for easy access to a vast amount of information but has also introduced an age of distrust where everyone is trying to critically analyze the news. One problem that journalists are currently facing is how to ethically bridge the gap between political dialogue and entertainment in an attempt to rise above this overcrowded space and get people interested in important topics. With this relatively new-found autonomy on the internet, some people like to express their ideas and opinions through memes. Should journalists do the same? The emergence of memes in participatory digital culture has produced imitations, reinterpretation and the further iteration of new memes. Memes go on to live as cultural artifacts that have three reasons. Their primary function is a virtual physicality where the feature of memes is to convey the human mind in digital media. Second, memes behave as social and cultural attributes to motivate the continuous creation of memes. Third, memes are widely consumed and reacted to by social media natives. A good meme is a meme that is widely consumed, relevant to many, and up to date. Memes in media have a social relevance as they act as a sort of development from political caricatures that have existed within newspapers for centuries. From a theoretical perspective, those three reasons imply an interaction between the agent and social system. Therefore, Gidden’s structuration theory serves as a model to further explore the spread and development of memes; he argued that social action is linked directly to the creation of rules and practices, and the meme is the product of social action. It considered memes are recursively reproduced by agents to verify their actions, so memes will continue to be created as long as they remain. More importantly, memes embrace significance, not only culturally but also politically. In terms of the emerging meme, countercultural and socially critical message rely upon memes to spread widely, because memes are the ideal vehicles that avoid dried political propaganda but still reach the similar impacts on capturing attention. Wiggins and Bowers, 2015, Memes as genre: :A structurational analysis of the memescape[J]. New Media & Society,17(11):pg. 1886–1906. According to our conducted research through a randomized sample, around 64% of participants believe that it would be a good idea to have memes as an entry point to the news. Memes always do have a cultural context that can often be universalized, but at the same time there are memes that break out of certain societal and political complexities within specific cultures. In recent times we’ve had memes be politicized for the purpose of sparking dialogue on social media. These memes are often embraced by groups of extremists in order to create discomfort within certain parties and minorities. For example, the use of pepe in the 2016 U.S. elections was used to embrace the idea of seclusion and racial stereotyping, belittling minorities’ struggles and turning it into humor. 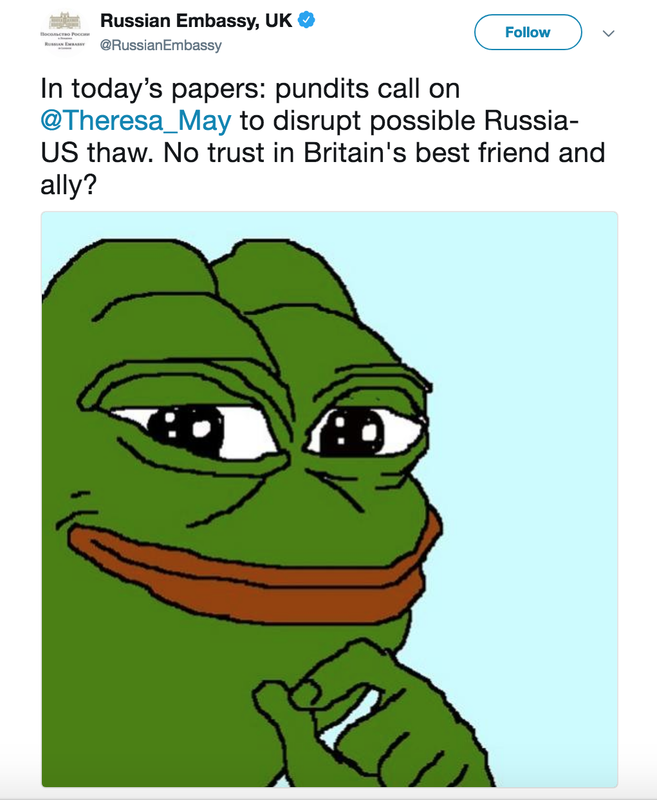 Pepe even made it to a tweet by the Russian embassy. Which allows this question to develop — what is the Russian embassy really trying to say? Members of the far right have recently used memes relating to themes of racial segregation and populism. Since their concern is mainly belonging to their determined social group with no collusion of outside culture, these feelings have been translated into political memes, especially during the french election. This has sparked feelings of fear and discomfort within the public. Making memes with discriminatory underpinnings to begin with would encourage the idea of being apathetic toward other people’s feelings and ideologies, thus making them is immediately immoral in terms of societal duties. Will memes pass the test of time? Memes have been proven to cause more harm than good and are directly linked to fads and trends within the internet culture. These satire images with captions are widely consumed as part of our cultural activity, and they usually offer content in a comedic way to represent the average daily struggle. Once memes entered the realm of politics however, the primary aim was irritation rather than amusement, further intellectualizing the use of memes in media would not be the best way to approach sensitive topics. 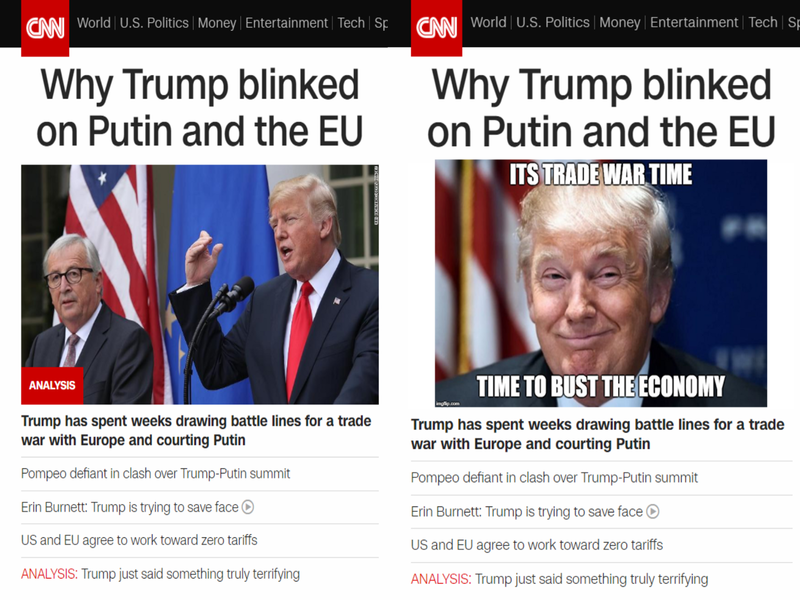 Although there’s potential for memes to be successful within journalistic work — as it could function as a catalyst to entice people to consume more news, the risk that comes with it generally overweighs the benefit. Nevertheless, in an era where technology rapidly reshapes our lives, it is difficult to predict how things will be in a year or two. Thus, we can’t offer an absolute conclusion regarding the future of memes and news, as it is a story only time can tell.